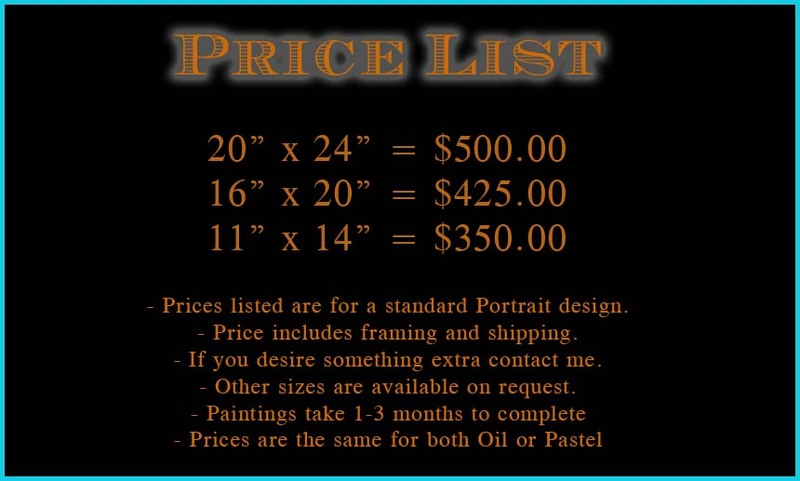 Once I receive your photographs we can discuss what type of portrait you’d like and what size you prefer. The photographs you supply will impact greatly on the portrait I will create. Please review the “How To” section for tips on the best way to photograph your pet to get the best results. Before we worry about deposits and such, lets make sure we have good photos and agree to the plan. A 25% Deposit is required to start work on a piece. The deposit is 100% refundable for any reason before work commences. Wait times vary anywhere between 1-3 months according to current workload. Contact me and I can give you an approximate delivery time. Also contact me if you have a specific date in mind. I will send progress shots of your painting during its creation for your input and direction. This is especially critical during the initial phase of the painting so know what the overall composition looks like and also during the final stages when the details are finalized. After completion of the portrait, I’ll e-mail a digital image of the final painting. At this time any changes in the portrait that you still require can be made. Once you are completely satisfied with the painting your final payment will be required. I ship world wide via USPS and each painting is packaged with care to ensure its safe delivery. Each piece is insured for its full value. Shipping costs are included in the price. If you would like to commission a portrait, or if you just have questions about the process, do not hesitate to contact me and I’ll respond as soon as possible.